Incredible ocean views like this one are one of the many reasons that the luxury Esperanza Resort is one of our favorite venues to work with in Cabo San Lucas. Immediately after the sunset, the sky glows orange, purple, and pink. At this time of day, the ocean reflects a rainbow of colors, too: dark blue, indigo, turquoise, and sky blue. The reception area, located on these bluffs, offers an incredible view of the ocean in all directions. Just below, the Esperanza Resort offers direct beach access right where the bride and groom took their post-ceremony stroll. 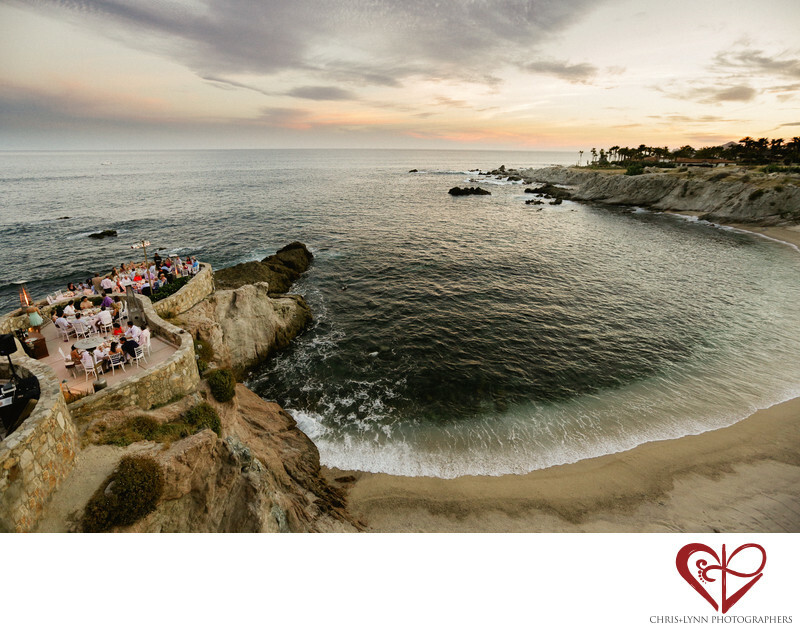 For a wedding reception, this venue offers guests an incredible view of the ocean, the sunset, and later, of the stars. 1/125; f/4.0; ISO 800; 16.0 mm.